Guys, I apologize in advance, but all I'm going to talk about today is futbol. Mainly because it's pretty much the only thing on my mind right now. First off, I had already written off the World Cup and decided the remaining matches didn't much matter to me now that my team, Costa Rica, had been eliminated. Which, for those of you who missed the match, it was an edge of your seat, hard fought, well played, futbol at it's finest, game! Those 'Ticos really laid it all out on the field and fought a valiant fight, they did Central America proud. In fact, their goalie is being lauded as the best goalie of the World Cup. Couldn't be prouder. Naturally, though, I vowed to myself I wouldn't watch another match. Since yesterday was my day off, though, I of course got tugged into watching the Brazil vs Germany match. Did any of you watch it? Because OH MY HECK!!!! Most embarrassing game in the history of futbol! Honestly, what a disgrace for Brazil. FIVE goals scored within the first half, four of which were scored within 10 minutes of each other, if I remember correctly, and the final score was SEVEN to one! Those Brazilians weren't even trying. As much as it pains me to say this, someone had to have been bought out because there is just NO way that could have happened otherwise. I feel so bad for the Brazilian fans, though! I'm not kidding you when I say that there were Brazilian children in the stands crying as if they'd just watched their mother get killed. THAT'S how disappointed they were! I'm seriously seething about this. (Lame, I know.) I mean, it's one thing to be the hosting country and get eliminated but to get eliminated like THAT? That's just disgraceful. Dishonor on the goalie, dishonor on the cow, dishonor on their whole team! Well, now that my futbol rant is over, let's get to this outfit. 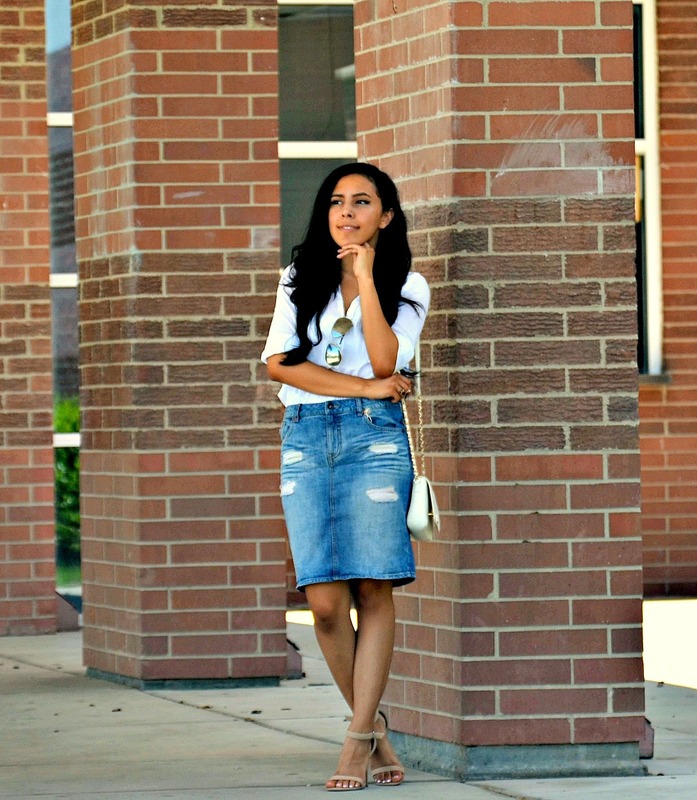 I'm loving the denim pencil skirt trend this summer, and I thought a fun way to do it would be to dress it up with all white. Also, ripped denim, you guys, I love it. It keeps things casual in a fun way! Anyway, that's all I have to say, really, other than, BRAZIL GRRRRRRRRRRRR!!!!!!!!!!!!!!!!!!!! Shame, shame, SHAME!